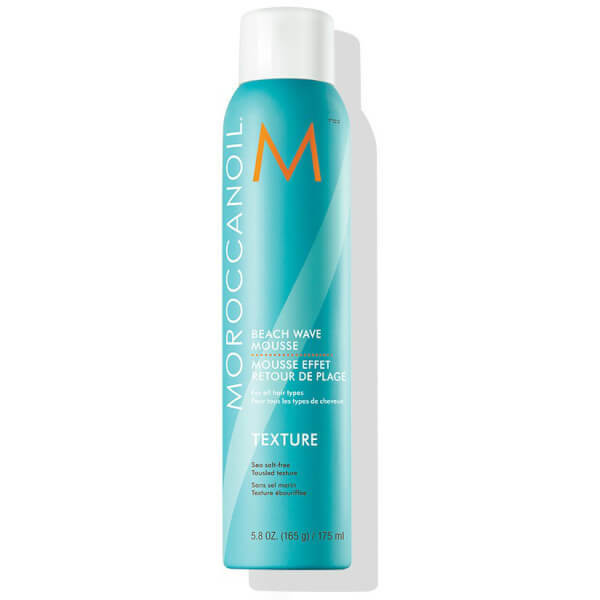 Create surfer-inspired locks with the Moroccanoil Beach Wave Mousse; a weightless, salt-free formula that leaves hair tousled and textured with ocean vibes. Infused with UV absorbers, the mousse protects from sun damage and maintains colour vibrancy, whilst adding volume and definition with flexible, lasting hold. 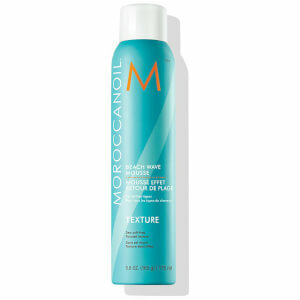 Achieve animated, beachy waves without stiffness or sticky residue. Shake vigorously. Dispense golf ball size into palms and emulsify. A little goes a long way. Using fingertips, rake evenly throughout wet hair from mid-lengths to ends. Air-dry or diffuse. Aqua/Water/Eau, Vp/Va Copolymer, Peg-25 Hydrogenated Castor Oil, Pvp, Butylene Glycol, Isobutane, Propane, Glycerin, Laureth-4, Parfum/Fragrance, Panthenol, Hydrolyzed Amaranth Protein, Hydrolyzed Soy Protein, Salix Nigra (Willow) Bark Extrac, Argania Spinosa (Argan) Kernel Oil, Carthamus Tinctorius (Safflower) Seed Oil ,Peg-12 Dimethicone, Cetrimonium Bromide, Aluminum Starch Octenylsuccinate, Behentrimonium Methosulfate, Ppg-5 Ceteth-20, Silicone Quaternium-3, Silicone Quaternium-16, Undeceth-11, Trideceth-12, Undeceth-5, Benzophenone-4, Polyquaternium-4, Cetearyl Alcohol, Caprylyl Glycol, Cetyl Alcohol, Butyloctanol, Benzyl Alcohol, Potassium Sorbate, Phenoxyethanol, Sodium Hydroxide, Linalool.